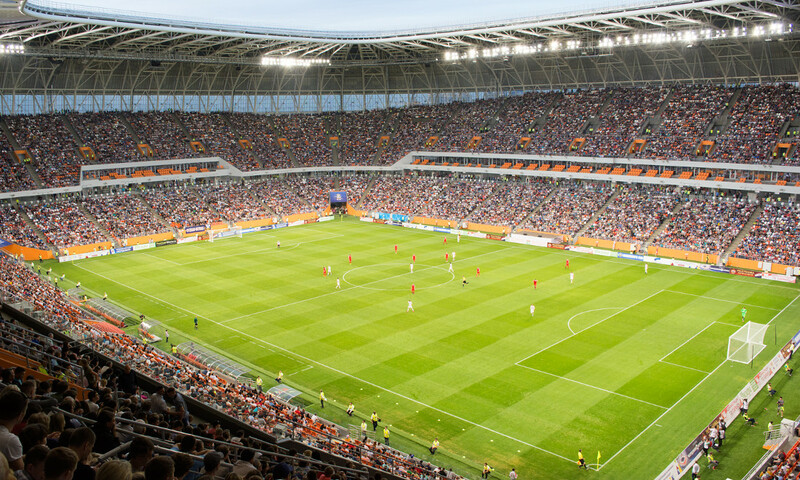 The Mordovia Arena, also known as Saransk Stadium and Stadion Yubileyny, is the recently opened new home of Mordovia Saransk and one of the playing venues of the 2018 World Cup. The stadium was first proposed in early 2010 before the World Cup had got awarded to Russia. Following various redesigns first building works began in late 2011, and soon after Saransk got picked as one of the host cities of the World Cup. However, works progressed slowly, and with the first structures of the lower tier barely up in 2012, the project stalled due to a lack of funding. Little activity was recorded in the next two years until works were picked up again in late 2014. 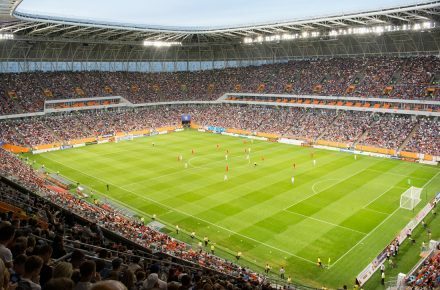 Folowing some further delays, the Mordovia Arena opened on 21 April 2018 with a league match between Mordovia and Zenith Ishevsk (0-0), albeit at a reduced capacity. The first full-capacity match, the third at the stadium, was played on 16 May. 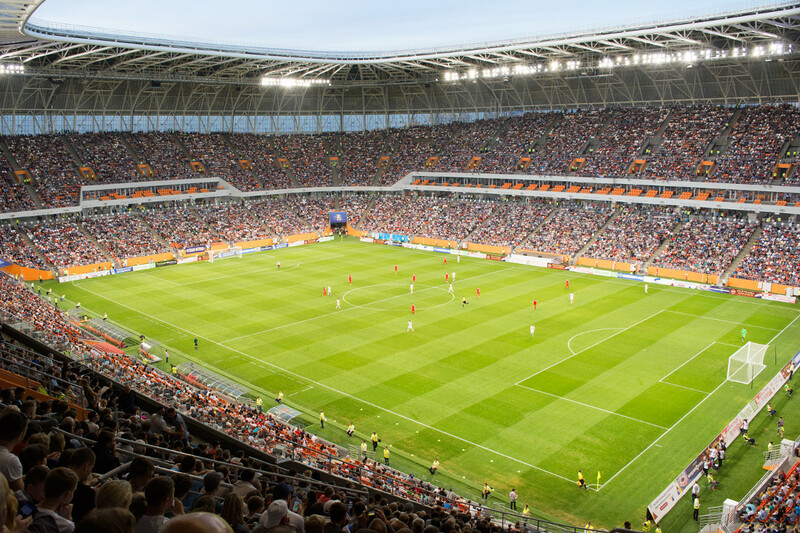 The Mordovia Arena will have a capacity of 45,000 seats for the World Cup, which will be brought down to 28,000 seats after the World Cup by removing the upper tier and turning it into a walking concourse. During the World Cup, the Mordovia Arena will host four first round group matches. The Mordovia Arena is located on the eastern edge of the small city of Saransk, though the distance from Saransk’s principal Sovetskaya Square is less than a kilometre, or a 10-minute walk. Saransk’s main railway station lies a little further north, but still only a little over 2 kilometres away, or 30 minutes walking. Saransk’s bus terminal, on the western edge of the city, lies much further away though, over 4 kilometres. While most central parts of Saransk are all within walking distance of the stadium, bus 44 can be useful to get there quicker, though the route from the railway station goes in a very roundabout way. It’s a quick connection from the bus terminal though. There are also multiple marshrutka’s running along Volgogradskaya street next to the stadium that can be of use. The Mordovia Arena is part of a large new development just across the bridge over the river Insar from Saransk’s city centre. It will form part of a new area consisting of residential units, parks, and shopping malls, but the city centre across the bridge is just as far away. At the moment, there aren’t many options to eat and drink around the stadium yet, but the city centre is a short walk away and has many options. There aren’t a whole lot of hotels in Saransk, and none directly near the Mordovia Arena, but there are various apartment rentals to choose from. In the centre, Saransk Hotel and Meridian are the two options at walking distance of the stadium, with a few more hotels further away. Click here for an overview of hotels and apartment rentals near the Mordovia Arena and here for options elsewhere in Saransk. Fc-mordovia.ru – Official website of FC Mordovia Saransk.